Got any idea what you want for your life? Or what you want in your life? Or from it? Well, although it would be more convenient for the present discussion if you said, “No… I don’t know what I want at all…”, the fact is nearly everyone has at least an inkling. It’s the urge that calls to us from the corners of our thoughts and feelings. It’s the intangible drive that pushes us toward some things and away from others. Our secret, or at least unspoken, desires influence our decisions every step of the way through every interaction of every day, and often without our ever knowing it. And that’s the sticking point, isn’t it? Most of us are all too regularly motivated by subsurface wishes that remain hidden from us, even as they alter the course of our lives. Think that can’t happen to you? Well, just take a moment to remember all the times you’ve given in to one of your favorite foods or vices, even after you were making a sincere effort to resist. That’s the power of “less-conscious” wants in our lives. My point here is not to make you feel guilty or powerless. We are all motivated by “unseen hands”. Our power lies in rending the veil. 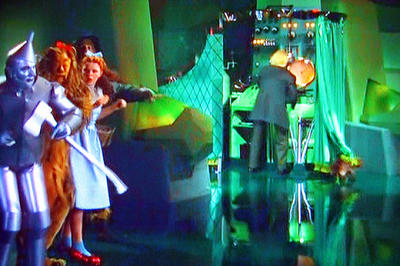 Like the pivotal moment in The Wizard of Oz, we must tear away the shroud of “the man behind the curtain” and expose his mechanizations for what they are in order to be free. So what’s behind your own curtains? Whatchu got in there?! What are your secret desires? What do you want? The flip side of this discussion is, of course, that the best way to get what you want in your life is to know that you want it – to claim it, to celebrate it, and to move toward it with conviction. The more time you spend discovering your self and your self’s agenda, the more power you bring to both, the more crystalline your identity will be, and the more realized you will become. When given proper attention and focus, the things we want in life transform from a list of hopeful ideas into the resonant creation of the life they represent. And although it contradicts modern “conventional wisdom” – if we give power to the things we want, and know that we can bring them into fruition by virtue of our intention, attention, and extension of effort, then rather than a bane to poison our happiness, our wants simply become signs of what lies in store for us. And that’s the moral of this particular story. The universe is a generous, abundant place, containing and offering all that we might ever need or desire. It has always provided for us, filling our bodies with energy, replacing our atoms with care and compassion, adjusting it’s every move to assist us. Simply by virtue of our wanting something, the universe responds and conspires with us to make it manifest. It has been doing this since the beginning of time, and continues moment by moment everyday, working with us to create. May I encourage you to pull out your master list of secret desires, clear out the attic of your wishes, and make a claim for all that you want for, in, and from your life. Write it down, make it into a song, draw a picture, or carve a sculpture – but make it plain and tangible. Let the edifice remind you of the thing you’re manifesting, and empower you to move yourself in collusion with the universe to create the life of which you dream. It’s yours – but only if you want it. Be well, my fellow future-makers. I'm here to empower *you* to live the life of your dreams. Whether you're looking to become your best possible self, have your best possible relationship(s), and/or do your best possible parenting -- I'll help you find your way and claim it! Things that happen at Seabright Beach ptV.